Stop at red is a campaign to reduce crashes and improve the status of cycling in the eyes of the public and policy-makers, and to tackle the attitudes of those cyclists whose behaviour perpetuates the image of cyclists as irresponsible. Its specific focus is on running red lights. To encourage cyclists to show courtesy towards other road users and pedestrians. To encourage greater compliance with the road rules. To improve the perception of people on bikes, by showing that most cyclists ride responsibly. Stop at red was inspired by a UK campaign, and created by concerned cyclists, alarmed about how cycling is being undermined by the reckless actions of an unrepresentative minority. We are simply asking people to Stop at red. It doesn't have to be a war out there. Produced with the support of the Road Safety Trust. You may get hurt. Others may get hurt - either directly by you, or by the effect of another vehicle having to take evasive action. The consequences could be fatal. 2. It annoys just about everyone. 3. It has an impact on general attitudes towards cyclists. It undermines our chances of getting improved facilities. Better cycle routes are funded by taxpayer's money. How can we make a case for better funding when our image is poor? We believe that an individual cyclist's behaviour can make a difference, so we are asking you to consider the consequences of your behaviour. Besides, what's the hurry? You already ride the fastest vehicle in town! Cycling is part of the solution, not the problem. It's good for you. What's more, if you use a bike as transport you are integrating exercise into your everyday routine. It's good for the environment. If you substitute it for motorised transport. It's good for society and culture. Cycle friendly towns are better places to live. Most traffic lights are activated when a passing vehicle triggers an electromagnetic coil buried in the road. You can often see where the road surface has been cut. Sometimes the council paints a row of diamonds or a little bike stencil to mark the buried cable. Position your bike above the coil to activate the lights. I've often seen arguments by cyclists saying that since breaking road rules, like running red lights, doesn't directly cause accidents, it doesn't matter. this completely ignores the indirect effect of generating hostility towards cyclists in other road users. There seem to be several differing accounts of the Outram incident, perhaps illustrating how deep the divide between different road user groups can be. both the articles and the on-line responses to them make for "interesting" reading. How often do cyclists run the red? How regularly do cyclists run the red? I have an hour or two of counts done in Wellington. Cyclists were a bit worse than cars, but not as lawless as pedestrians. The level of compliance changed dramatically from one intersection to another. It could be argued that an engineering solution should be considered where compliance is particularly poor (e.g. If 75% of riders are heading through red along the top of a T intersection, then put in a cyclist bypass (especially if the riders happen to be going up hill, or there is a seldom used footpath available, like opposite the Karori fire station). The issue of lights not being triggered by bikes is something that needs to be addressed. Electromagnetic sensors designed for bikes don't work with carbon fibre. I know this complicates the issue, but it's such an easy out for riders that I think you need to counter it at the outset. I stopped running red lights after a car driver followed me through one. I'd decided to sneak through on the pedestrian phase, and the driver behind evidently didn't check the lights but assumed since I was going, the light must be green. Sadly for him, there was a police car right behind him. The siren went, the poor bloke no doubt got pulled over, I disappeared feeling like a right arse, having not only contributed to endangering a bunch of walkers but probably indirectly earning this driver some demerit points or something. That was it for me. Interesting how red light "lawlessness" reflects the priority given to users, pedestrians, cyclists, the motor vehicles (in order starting at lowest priority in terms of infrastructure and facilities). i.e. pedestrian light phasing priority is usually the worse, with usually no where to wait out of the rain etc. 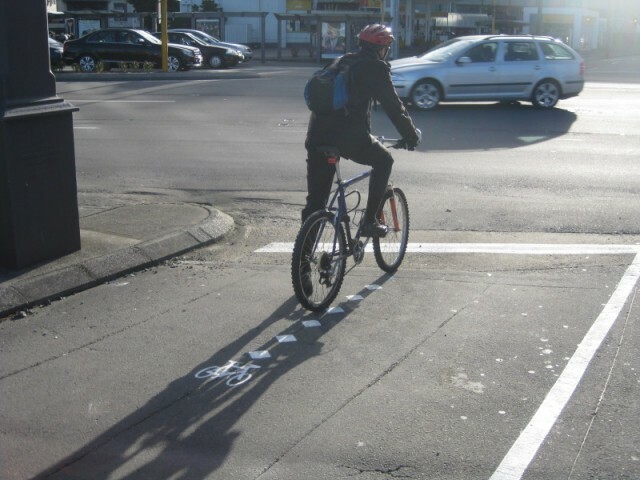 In ChCh there is work being done after the Gehl report to look at how this might be improved. Pedestrians are supposed to be (according to the manuals of best practice) at the top of the pecking order. In CHCH there is an ongoing situation going south from Antigua Street bridge. Highlighted by a cyclist crossing on the green phase for pedestrians and cyclists going south who has twice nearly been hit by a cyclist coming from the right speeding through on a red light. The comment has been made that some cyclists "jump" the red light, and sometimes this is to get ahead of the flow (abit like an advanced cycle box in terms of aim) whereas cars tend to go through an orange and often red light (something most cyclists would not do, as too risky). When a cycle lane continues after a T-intersection then there should be no reason cyclists can not just keep cycling with a signal to allow them to do this, if not an issue for pedestrians. Any cyclist by passes need to be best practice including in relation to pedestrians. We don't want to shift the problem to pedestrians, already frustrated with crossings themselves. Why do bums on bikes not have to obey traffic lights like us real people? This morning on the way to work one of them – without a crash hat I might add – snuck through our traffic jam, wobbled on his bike while he waited for a gap in the traffic and then rode right through the intersection against the red light which was holding up the rest of us . I see it often, and they irritate me. I agree with your correspondent Jenny Mathes, about cyclists running red lights. It breaks the rules and annoys just about everyone. So that's why Cycling Advocates Network is launching a Stop at Red campaign. Stop at Red aims to encourage cyclists to show courtesy towards other road users, and to encourage compliance with the road rules. Boo to bad biking behaviour! Mind you, cyclists get pretty annoyed when pedestrians step out without looking, and when drivers speed or overtake too close. This story is not about bad bikers, it's about showing common courtesy and following some simple rules, whether you are on foot, on your bike or behind the wheel. A new campaign has been launched in the UK called Stop at Red encouraging cyclists to sign up to ‘pledge' their obedience to traffic signals. This campaign raises a whole host of issues for me. I think it is well intentioned but unfortunately wholly misguided. I guess I should start out by saying that I run red lights all the time, routinely, and I'm not ashamed of it and I won't apologize for it. Of course I never take anyone else's right of way, and I only run the light if there's no one coming. There are a hell of a lot of lights in Bristol that seem to stay red for no particular reason. Everyone just sits and waits. We're very well trained. The sponsors of this campaign are confusing safe behaviour with law-abiding behaviour. You can follow every law and still put yourself in a terribly dangerous position (i.e. in the door zone). By the same token, you can slow and look around carefully at red lights and stop signs and proceed when no one is coming and you'll likely never get into trouble. Blindly following the law is a recipe for getting hurt on your bike. Better to trust your own hearing, sight, and instincts than the government's rigid idea of ‘health and safety' which is quickly spiraling out of control, as evidenced by the recent replacement of a Guy Fawkes Bonfire with a video of a bonfire in Devon. I have always been very conscious of cyclists on our roads, especially in Wellington where I live. I have always given them space. I have even picked up them and their mangled bikes after incidents, and taken them to hospital and returned their bikes to their homes. Coming home tonight, I allowed a cyclist plenty of space to watch in horror how he then ran 2 red lights, one of once pedestrians were crossing. When I was along side him further down the Parade in Island Bay ( a nice wide street) I suggested that he obey the road rules. He called me a c*** and to f*** off. That is it for me. I have watched plenty of cyclists disobey the road rules, cut in front of pedestrians, etc... and have still defended them to other motorists I know. I will no longer allow them the space bubble. I will not intentional threaten but neither will I support. I'm sorry to hear of this incident. That kind of rudeness and lawbreaking is unacceptable. Would you consider reporting this to the Police? It would be a shame if one person's actions caused you to take less care than the law requires around other road users. Why lower your high standards for the sake of one idiot? Please reconsider. Breaking traffic laws is not confined to people who ride bikes. According to the Ministry of Justice, cyclist traffic offences total less than 1% of all traffic offences per year. However, these are still unacceptable. Because CAN is concerned about the poor perception of some people who ride bikes, we are this year launching a Stop at Red campaign. It aims to reduce crashes and improve the status of cycling in the eyes of the public and policy-makers, and to tackle the attitudes of those cyclists whose behaviour perpetuates the image of cyclists as irresponsible. I hope you don't mind that I have shared your story with our Committee. It helps us understand the issues. Please feel free to call if you'd like to discuss further. Cyclists often have valid reasons for behaving the way they do, paralleling the reasons that motivate pedestrians and motorists. Behind most of these actions is a sense that since the city denies cyclists the barest minimum of space or respect, cyclists must carve out their own safe and efficient path as best they can. This is not to excuse cyclists who are reckless or inconsiderate and those who frighten people needlessly - they deserve public scorn just as does a rude or reckless motorist (they also deserve an education in better riding habits). Some cyclists ride briefly on the sidewalk when double-parked vehicles block the street because it is safer and more passable than the clogged roadway. Some cyclists ride against traffic, particularly on the avenues, because the choice of routes in the correct direction is limited. For instance, only cyclists with rugged mountain bikes dare ride regularly on Sixth Avenue, which has been a virtual mine field of steel plates, huge bumps and deep holes since it was torn up for reconstruction in 1989; the next logical choice, narrow Madison, is choked with diesel-fume buses. New York cyclists are notorious for running red lights. By now, going through red is an ingrained cycling tradition. Big-city impatience and the desire to maintain hard-earned momentum discourage bicycle riders from stopping fully when the law dictates - the same is true for pedestrians. But, though it may seem surprising for non-cyclists, many riders point to health and safety as reasons to disobey red lights. For one thing, going through a Manhattan red light gives the cyclist a block or two of respite from the exhaust fumes of accelerating cars and trucks. More importantly, bicycles and cars accelerate differently. Motorists waiting behind a stopped bicycle are in no mood to wait for the cyclist to reach cruising speed. Pressure from impatient drivers is especially unnerving for novice cyclists, who need a modicum of open street space to start up. Because motor traffic occupies that space, the only way bicyclists can start up safely is by getting in front of the traffic, which often entails running lights. Reducing the frequency and danger of bicyclist red-light running will probably require the following steps: educating cyclists; educating motorists about bicyclists' right to the road and need for safe distance; enforcing laws forbidding intimidating and dangerous driving; and, at certain intersections, reconfiguring streets and traffic signals to give bicyclists a head start when the light turns green. As sad as this is - what will it take for cyclists to realise they are NOT invincible and need to adhere to the road rules just like everyone else?! Given the way some of the cyclists around town behave I am surprised there are not more fatalities - other than for the grace of drivers with lightening reflexes. Yes this is sad but road rules are there to protect people - we need to follow them. know one of the things that most riles drivers is when cyclists believe the road rules do not apply to them. Thus I endeavor to obey them whenever doing so does not result in undue danger to myself or others. "Hi buddy, when you run red light like that you make the rest of us look like idiots"
I have tweaked the logo. I removed "Use your head" and replaced it with "Give respect, get respect." Telling people to use their head will turn people off. A big no-no in campaigns. WCC will paint diamonds the road indicating where the induction loops are, later this year. Some people say their bike doesn't activate traffic lights. In a bid to make cyclists feel safer, one US town has installed motion sensor technology that can extend a green signal for a cyclist if he/she is approaching an intersection at speed. The motion sensor technology, which is called The Intersector, uses microwave motion sensors on a mounted intersection pole to recognise a bicycle and then sends signals back to the traffic signal control box to prolong the green light so the cyclist can pass safely through. Based on military technology, the town of Pleasanton in California is the only place in the world to use the system at the moment. The motion sensors distinguish between bicycles and vehicles passing through street intersections by measuring the length and speed of an object approaching the intersection pole. When a traffic light is already green, a cyclist typically receives an extension pass-through time of about five seconds. For vehicles, the extension time is two additional seconds. Bicycles stopped at a red light receive 14 seconds of green light time to pass through, whereas vehicles stopped at a red light receive only four seconds. Pleasanton council officials has so far installed six Intersector devices on a selection of intersection poles in the town and plan to install four more in the next few months. Not all cyclists run the red. Cyclist traffic offences total less than 1% of all traffic offences per year - a negligible figure. I agree that we shouldn't tolerate breaking the rules or lack of courtesy, but let's keep this in perspective. Data is not the plural of anecdote. For every errant cyclist, I could point to 99 examples of unlawful or dangerous driving or jaywalking. Indeed, Ministry of Justice figures show that cyclist traffic offences total less than 1% of all traffic offences per year. Is this really the top priority for Police? Regarding the situation Mr Cunneen describes, perhaps he should freshen up his knowledge of the Road Code: a right turning vehicle is required to give way to traffic going straight through. The fact remains that we all win when more people ride bikes more often. People are healthier, traffic congestion is cut, road building bills are lower, our air is cleaner, and remaining drivers can always find a parking space. What we need is smart investment in attractive and safe cycle facilities, not finger wagging. "If cyclists want to share the road with motorists, and be respected by them, they need to play by the same rule book. Cycling organisations evidently endorse this; check out the www.stopatred.org.nz site. Perhaps then other road users might have more regard for cyclists and fewer would be maimed or killed on our roads."